Understanding how human perception differs between observing the real world and viewing game worlds helps us build great visual tools. The real world is a beautiful place, and our eyes excel at taking it all in. Until recently, though, there has been a gap between the fidelity of the real-world and what we’ve been able to recreate and display in games. This gap will narrow with HDR (High Dynamic Range) display technology, which can reproduce a wider range of colors and contrast. Lumberyard’s HDR pipeline—rendering, lighting, and visual processing—can help developers take advantage of this new technology. In this post, we’ll explain the importance of an HDR pipeline for creating games with color and contrast that can match the real world, and how Lumberyard can help unlock the potential of HDR. The human eye has a wide visual range across different intensities of brightness. Our eyes can adjust to lighting situations ranging from a starry night or full moon, to a well-lit office room or sunny day. 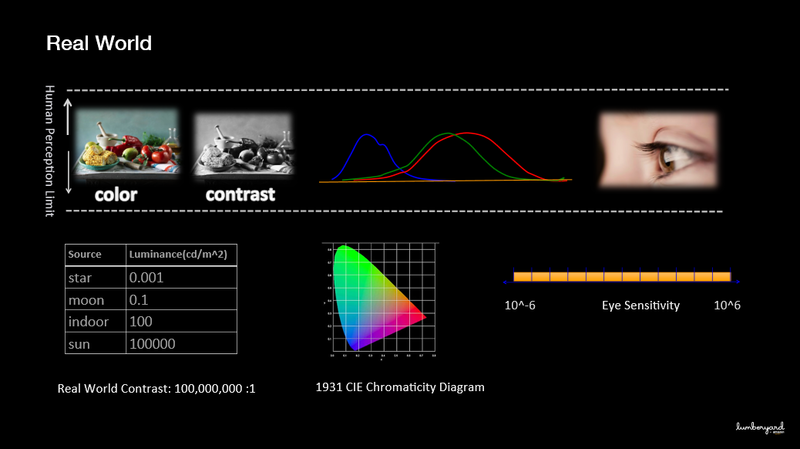 The Luminance chart on the left of Figure 1, the Chromatic Diagram at center, and the Eye Sensitivity chart on the right, show the full range of real-life colors and contrast the human eye can observe. There are two significant technical hurdles that prevent game developers from making game worlds look as good as real life: the game engine graphics pipeline and LDR displays. Every stage of the graphics pipeline in a game engine reduces contrast and color. The degradation in quality, as illustrated in Figure 2 below, starts with modeling: a digital camera takes source photos of the real world, and part of the visual range gets lost in the photograph. That source photo is sent to an artist, and the artist’s recreation of the object loses fidelity. Once in a game engine, the textures are applied to a model, rendered, and finally displayed to the player. If a level is looking too dark or enemies are too hard to see, game designers might ask for colors to be changed or the brightness to be increased, and this change reduces the dynamic range further. After the real world is interpreted through all of these layers, the losses to contrast and color can be substantially different than the source material. Lumberyard’s HDR mode improves this pipeline, preserving a full-value range and passing it through to next-generation HDR displays. This overcomes many of the limitations shown in Figure 2 and results in a much brighter, full-color image that is more pleasing to the eye. Lumberyard’s upcoming Beta 1.3 release will ship with an HDR pipeline in place, and your project will automatically begin to benefit from this technology. Lumberyard’s HDR graphics pipeline solves part of the problem, but the biggest bottleneck is the common LDR display. LDR displays impose contrast and brightness limitations on their outputs, so even high-quality HDR data won’t look much better on most monitors. 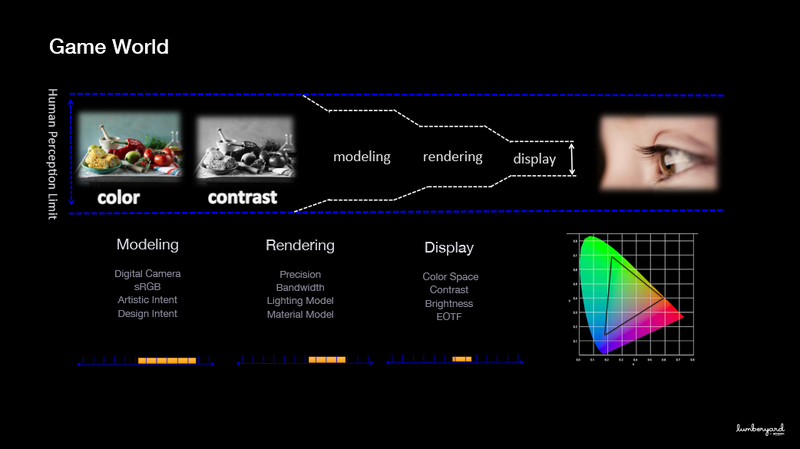 In Figure 2, the black triangle overlay on the Chromaticity Diagram shows the color limits of traditional game engines outputting to LDR displays. Sending HDR-ready graphics from Lumberyard to an LDR display is akin to drinking fine wine out of a Styrofoam cup. Don’t make the mistake, however, of thinking that HDR still belongs in the far-future. An LDR pipeline is fine for the PS4 or Xbox One, which don’t support HDR, but it won’t be sufficient for very long. HDR displays are already shipping, and all major manufacturers will offer consumer HDR devices at affordable prices by the end of 2016. Research from market analysis company IHS predicts that HDR display sales will rise from 2.9 million in 2016 to 32.6 million in 2019. With HDR, artists will have more space to explore and express themselves, with a greater variety of colors and environmental rendering tools. The best time to fully master your HDR game is before HDR displays are ubiquitous. For artists and developers, Lumberyard’s HDR tools make working in the full color range intuitive and responsive. Graphics research has been the focus of my entire career. I have been impressed at how much our team has been able to achieve with Lumberyard and how quickly we continue to advance the technology. We’re just getting started. With Lumberyard Beta 1.3, not only will the engine deliver on the promise of HDR, our toolset will allow you to take your scenes to this new era of display technology. Lumberyard makes HDR easy. This post is based in part on Hao Chen’s presentation at GDC 2016. In this talk, Hao and Jonathan Oakes explain what HDR is, how it works, and how artists can take advantage of it in Lumberyard. Their presentation also explores the physics and math behind light, color, and human perception. You can download the slides from this talk here. For nearly two decades, Hao Chen has led graphics R&D and game engine development at a number of game companies, including SingleTrac, Microsoft, and Bungie. Hao helped shape the core technology for some of the most innovative and influential games in history, including the Halo series and Destiny. He is also a frequent contributor to graphics and game conferences. Hao recently joined Amazon’s games technology group as a senior principal engineer. In his spare time, Hao enjoys photography, making music and films, and piloting airplanes.